After finding the route to the lost city of Neruzavin, the adventurers must mount an expedition into the vast and deadly desert region called the Parchlands, where they hope to catch up to their treacherous former employer. Once they brave the heat-blasted wasteland, the heroes arrive in an abandoned city at Count Lowls's party, recover a vile tome, activate the city's Star Stelae, and perform a powerful ritual that allows them to follow the insane noble to Carcosa. Along the way, the heroes must be careful they don't wake the slumbering Great Old One or stir up the flying polyps sealed beneath the city! 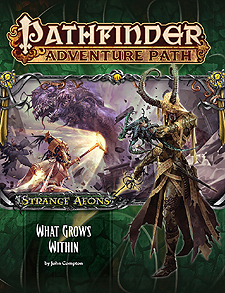 "What Grows Within," a Pathfinder RPG adventure for 13th-level characters, by John Compton. Examination of the fungal blot that spreads through dreams in an article about the Great Old One Xhamen-Dot, by James Jacobs. An exploration of the blasphemous tome known as the Necronomicon, by James Jacobs. An icy tomb hides a terrible secret in the Pathfinder's Journal, by Arinn Dembo. A bestiary containing a new Great Old One and other hideous monsters, by John Compton, Adam Daigle, and James Jacobs.